Sweden’s spectacular Icehotel has just opened for the winter season and the first images of their hand carved suites are absolutely breathtaking. Located in the tiny village of Jukkasjärvi 200 kilometers north of the Arctic Circle, the 26th annual pop-up hotel was carved from 5,000 tonnes of snow and ice harvested from the River Torne. This year’s Icehotel features 19 individually themed and hand carved suites that feature art as varied from a 1970s-inspired “Love Capsule” to a recreation of a 1920s horror cult film. Created from enough material to make 700 million snowballs, the 55-room Icehotel is erected every year for a few magical winter months until it melts away in spring. The intricately carved 5,500-square-meter structure takes around two months to complete, with the harvesting of river ice beginning in March. 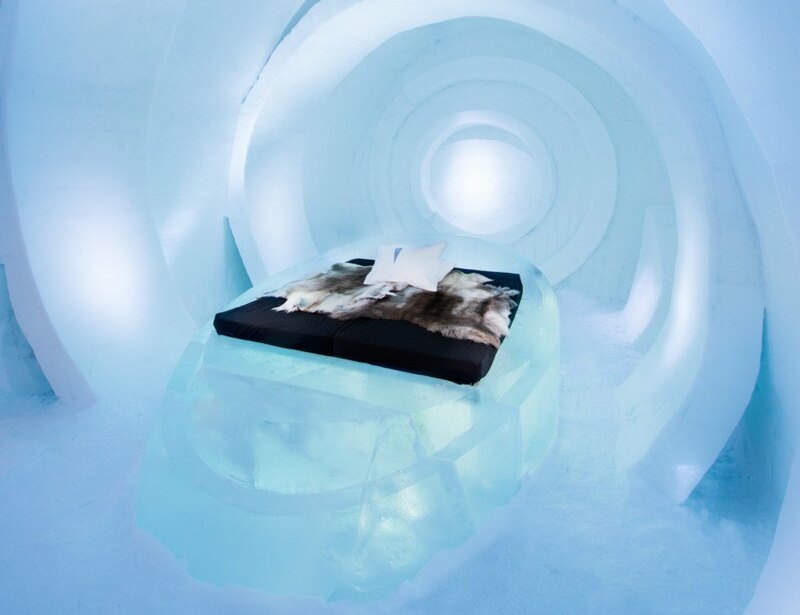 With walls and bed frames made of ice, the unique art suites can drop to temperatures below freezing. Fortunately, however, the mattresses are not carved of ice. Overnight guests are given expedition-style sleeping bags, hot lingonberry juice, and packing guidelines for warm clothing (and complimentary loans of warm outer clothing). In addition to the cool suites, Icehotel also offers warm suites, an Icebar, main hall, restaurant, and a church. Stunning chandeliers made from 1,000 hand-cut ice crystals hang from above. 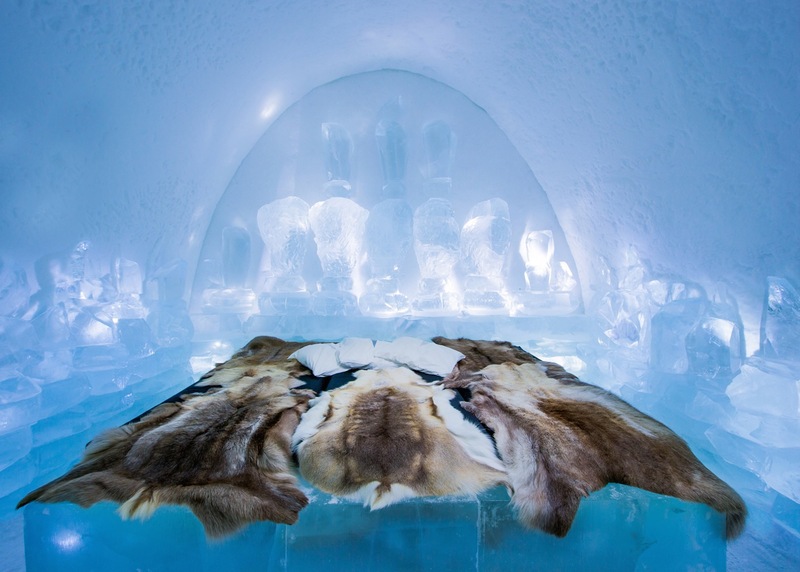 However, our favorite feature of the Icehotel will always be the cool art suites. This year’s 19 designs were whittled down from 130 submissions and are positively enchanting with their attention to detail. Prices for overnight stays in the cool rooms range from SEK 2,500 ($300 USD) for a simple snow room to SEK 8,500 ($1,000 USD) for the spacious deluxe suite that boasts a heated ensuite bathroom and sauna. "Eye Suite" by Nicolas Triboulot & Cédric Alizard. "Fractus" by Anja Kilian & Wolfgang A Lüchow. "Cesare’s Wake" by Petros Dermatas & Ellie Souti.